Thousands of faithful members and friends of the late, beloved Gordon B. Hinckley, streamed into Temple Square today, Saturday, February 2, 2008, to attend funeral services in the Salt Lake City Conference Center. As with his viewing, guests streamed through Temple Square, where they reverently reminisced and waited, in some cases for hours, to enter the LDS Conference Center funeral services. 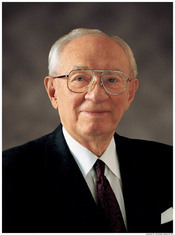 President Hinckley passed away peacefully on January 27, 2008, at 97 years of age, the longest-living Prophet of the 13 million-member Church of Jesus Christ of Latter-day Saints. During the services, David H. Burton, of the Church's Presiding Bishopric Office, addressed the congregation. Elder Burton delineated the years of the Prophet's service and accomplishments. He mentioned specifically President Hinckley's efforts to "break the cycle of poverty," to increase the availability of temple blessings, and to administer in Church affairs worldwide. He recounted the Prophet's conceptualization and overseeing of the 21,000-seat Conference Center in which the funeral proceedings took place--the Prophet even specifying that the granite from Cottonwood Canyon be used in its construction. In fact, his casket lay just feet away from a beautifully carved pulpit fashioned from walnut trees from the Prophet's own yard. Virginia Pearce, daughter of President Hinckley, spoke of her admiration and love for her father, whose legacy, he claimed, was not just "theirs" but for the entire family of God's children. She noted that the Prophet recognized and valued his strong ancestral stock, three generations of valiant members preceding him, as well as the legacy of generations after him. Elder Tingey spoke of President Hinckley as a great "communicator," and remarked that the Prophet made legendary strides in Church expansion, educationally and in extending the inspired work of the Quorum of the Seventy, the Church's leading missionary council. In a moving address, Elder Henry B. Eyring, Second Counselor to President Hinckley, spoke of the Prophet's great optimism. Elder Eyring commented that his optimism was justified "not in his own powers to work something out" but through his faith in God's power. "His optimism stemmed from his faith in Jesus Christ and His atonement." Elder Eyring noted the unassuming nature of the Prophet, and, referring to members of his family, said that "any prominence that has came to them didn't show any more than it did in President Hinckley." Elder Boyd K. Packer, next senior apostle to Thomas S. Monson in the Twelve, spoke poignantly about the charm bred of humility in President Hinckley's approach to people around the world, whether he was engaged with "laborers on a dusty road or those in a palace." That charm was his brotherly love. Elder Packer paid tribute to his wife, indicating that much of his growth was attributable to Marjorie Hinckley, who was patient and constant through the travels and undertakings of her husband. President Monson, senior apostle in the Quorum of the Twelve Apostles, was the concluding speaker on the program. He referred to President Hinckley as his longtime friend. They'd known each other long before their call to serve together, which they did, for 44 years, through "heartache and happiness." He called the Prophet a "giant"--a giant of faith, of love, of compassion, and of testimony. He described the Prophet as an "island of calm in a sea of storm," one who "guided us undeviatingly on the path back to our Heavenly Father." He expressed the tender feelings of one who had been at his side just a few hours before his passing, offering a priesthood blessing, knowing that he was being summoned to the other side of the veil (or, to the spirit world, where we go when we die). There President Hinckley would be reunited with his wife and ancestors, who preceded him in death. Kathleen Walker, President Hinckley's daughter, closed the services with prayer, acknowledging the love felt towards President Hinckley and requesting the Lord's assistance in our efforts to bring honor to him and the Savior. President Hinckley was buried in the Salt Lake City cemetery. The burial site was dedicated by Richard G. Hinckley, as a resting place for the Prophet, a hallowed, peaceful, and sacred place to revere and remember him and to have our hearts turned to remember the Savior. His wife, Marjorie Hinckley, passed away in 2004, after 67 years of marriage, the confidante and companion to the late Prophet. This page was last edited on 1 September 2010, at 22:07.